Learn how to weave a simple scarf in this introductory weaving workshop. You will learn the basics of weaving on a rigid heddle loom. In the first class, you will learn how to warp your loom, be introduced to the terminology, and begin to weave the scarf. The second class will be devoted to taking the scarf off the loom and discussing washing and blocking your finished piece. Students who rent their looms from 3 Kittens may keep the loom for up to two weeks following the class in order to make another project or two. 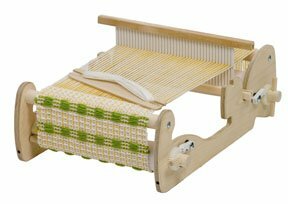 Please note - If you are planning on bringing your own loom to class, you must have an 8-dent heddle as part of your loom. Email 3kittens@3kittensneedlearts.com to find out more about what a heddle is and how to measure it well before the class start date. We will do our best to help you find the appropriate heddle. Requirements: Only your interest in weaving! Instructor Bio: Connie LaTendresse?s love of all things fiber goes back to learning to knit from her favorite aunt in third grade. Since then she has increased her fiber interests to include sewing, spinning and weaving. She loves to weave on most any kind of loom, but especially love the versatility of the rigid heddle loom. Connie teaches a variety of rigid heddle techniques in classes at the Weavers Guild of Minnesota.